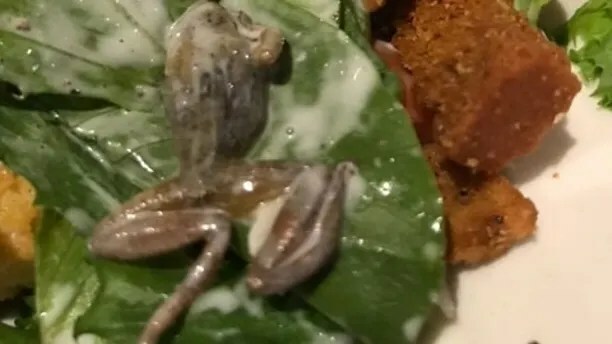 A woman from San Dimas, Calif., tells Fox News she was “beyond grossed out” after finding a dead frog in a salad she ordered from BJ’s Restaurant and Brewhouse. Cepeda and her family were dining at the BJ’s in West Covina when she claims she noticed something off about her salad — but only after she took several bites and tasted something “a little sour,” reports the San Gabriel Valley Tribune. To Cepeda’s horror, her husband and daughter surveyed the salad and broke the news that, no, it wasn’t lettuce. “It’s a frickin’ frog,” Cepeda’s husband responded. In her subsequent one-star Yelp review, Cepeda, 40, says she notified the manager about the unwanted fixin’, but he only offered to comp her meal. “I told him this frog could contain salmonella and who knows how long it’s been sitting in a produce bag,” she wrote. “He still made us pay for our drinks which consist[ed] of three beers total!” she added. Indeed, Cepeda told the San Gabriel Valley Tribune that she’s felt “queasy” since the incident. She went to a doctor who told her she wasn’t suffering from salmonella poisoning — healthy amphibians can carry salmonella, according to the CDC — but he prescribed antibiotics to treat a possible bacterial infection she may have contracted. BJ’s Restaurant and Brewhouse has since reached out to her, but Cepeda claims their response was a little lacking. In a statement obtained by Fox News, a representative for BJ’s Restaurant claims the company is looking into the situation. The case has also been referred to the California Department of Public Health, an investigator for the Los Angeles Department of Public Health confirmed to the San Gabriel Valley Times.